This entry was posted in Year 4 TDIWH and tagged Atlanta, benzene, bottled water, Georgia, lithium, Superfund, toluene, typhoid fever, USEPA, Valley of the Drums, water on September 18, 2015 by safedrinkingwaterdotcom. 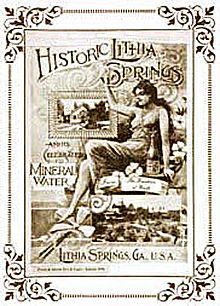 This entry was posted in Year 3 TDIWH and tagged Atlanta, benzene, bottled water, Georgia, lithium, Superfund, toluene, typhoid fever, USEPA, Valley of the Drums, water on September 18, 2014 by safedrinkingwaterdotcom. This entry was posted in Year 2 This Day in Water History and tagged Atlanta, benzene, bottled water, Georgia, lithium, Superfund, toluene, typhoid fever, USEPA, Valley of the Drums, water on September 18, 2013 by safedrinkingwaterdotcom. 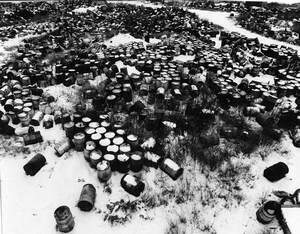 September 18, 1981: USEPA Press Release–“An expenditure of $400,000 will be made from the new Superfund for emergency cleanup work at Kentucky’s top priority hazardous waste site–the Valley of the Drums, near Louisville. Anne M. Gorsuch, Administrator of the U.S. Environmental Protection Agency, said today EPA will spend the money to pay for removal of about 1,500 drums containing chemical waste to reduce the possibility of fire. This entry was posted in This Day in Water History and tagged Atlanta, benzene, bottled water, Georgia, lithium, Superfund, toluene, typhoid fever, USEPA, Valley of the Drums on September 18, 2012 by safedrinkingwaterdotcom.